Barbara teaches from her home studio where she takes a maximum of five students in each class. The classes are very relaxed and friendly, with a strong focus on individual attention. All classes are conducted in five-week programs and pre-booking is necessary. These are general classes suitable for all levels of experience. The emphasis is on a range of functional movements combined with breathing. We practice slowly, with awareness, in order to facilitate increased well-being – body & mind. The tone of the class is always determined by the time of day and energy of the group as a whole on the day. All classes include asanas (postures) practised dynamically with mindful attention to movement and breath. Postures may be practised individually – moving in and out of the posture a number of times to deepen awareness of functional movement patterns, they may be held for a number of breaths to deepen your experience of the posture, or a number of postures may be linked together to form a sequence. Following the asana practice is a period of guided rest for 10 -15 minutes and we finish with breathing exercises (pranayama) . These are classes suitable for anyone wanting to reduce non-specific and/or chronic back pain. Perhaps you have an achy back at the end of a working day, notice back tension when gardening, or have accumulated tension after a previous injury, etc. Whatever the reason, these classes will help relieve current pain or tension and promote long-term back health. Each class begins with a period of relaxation to aid the release of tension, followed by postures and movements that are useful in improving back strength, core stability, and mobility. They promote healthy spinal alignment and improved postural awareness. We end with a second period of rest to integrate the benefit of practice and further release tension. effective breathing techniques, those useful for aiding movement and keeping you safe and also those for enabling deep relaxation in order to release chronic tension. mindfulness to increase the mind-body connection which will bring awareness to postural and lifestyle patterns that may be contributing to your pain. Note: these classes are not suitable if you are experiencing acute pain due to injury etc., In these circumstances, you may find individual therapy sessions more appropriate. If you have any concerns about your attendance, please contact Barbara to discuss. These are themed classes to assist students facing similar health conditions. They are more specialised than regular group classes and are designed to educate and provide participants with practices to assist in managing their conditions. Each participant is provided with a personal program for practice at home to facilitate progress towards health goals. 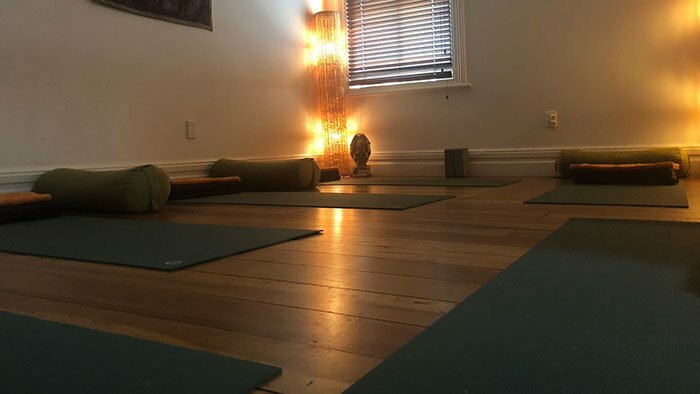 The nature of the class is dependant on the theme of the class but, as with general classes they will usually include asanas, breath work and rest/relaxation. Pregnancy classes are suitable for women from the second trimester of their pregnancy and can be attended right through until baby is born. Pregnancy yoga is well researched and widely recognised as one of the most important self-care practices women can undertake during this special time of their lives. Yoga for Svastha & Healthy Backs classes are conducted in 5-week blocks (prebooked & prepaid) and can also be attended casually. However, casual attendance must be pre-booked to ensure that there is space available in class. Pregnancy classes are available in 5-week blocks only i.e. no casual attendance is available. Please check the Pregnancy Yoga page for more information. Yoga Therapy Programs – Variable pricing.